In 2009 Nathan Millward set off from Sydney, Australia, on a 105cc Australian postal bike named Dorothy. His destination? England. 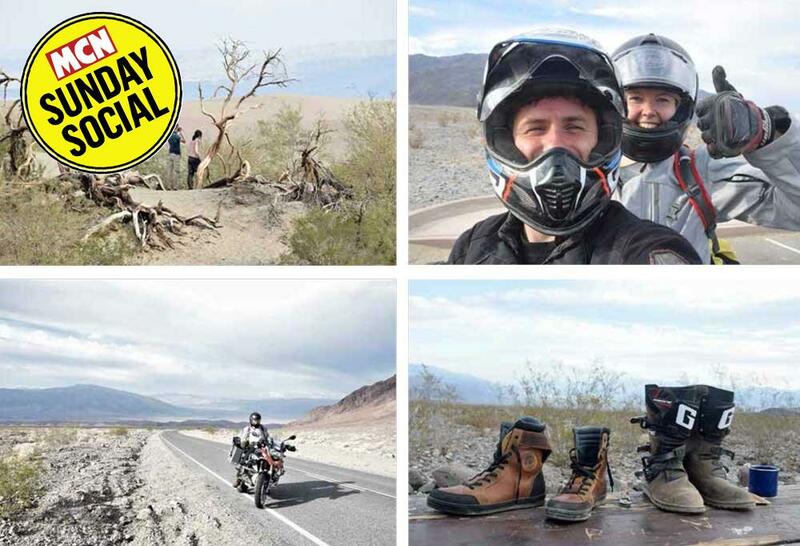 Since the trip Nathan has gone on to ride across America on the same bike, and now finds himself a freelance motorcycle writer and tour operator. Nathan, we’ve not spoken in quite a while, how are you? You’ve got a stand again? What tours have you got coming up? Yep! So, what’s for breakfast at the café? What are your riding essentials? What’s your mission for a Sunday ride? You can get a ferry from Denmark? I thought it would be a bit longer. “There used to be a ferry from Scotland but I think that stopped 10 or 15 years ago. It’s not that far from the top of Scotland, you just go past the Faroe Island and then there’s Iceland. But to go from Denmark you have to ride 1000 miles through Europe to the top of Denmark. Then after a day of sailing you’ve only just gone past the Shetland Isles. Iceland’s a place I’ve always wanted to go. Everybody I know who’s been says it’s amazing. “I’m probably the odd one out I suppose, but then I always find people say it’s amazing to justify the fact they’ve been there, I don’t think they always tell you the truth. For me it was a bit overrated – I didn’t get great weather for a start. The landscape’s bleak, the weather’s bleak and it’s quite expensive when you want to upgrade to hotels and restaurants. If you want to camp and cook your own food it’s still quite cheap. "For me it’s a victim of its own success – everyone who is there is a tourist. Everyone on the road, everyone you meet is a tourist, so you just feel like you’re part of this tourist experience, you don’t feel like you’re travelling or getting away from the tourist zones. So where would you go that’s off the beaten path? Have you done your America trip now? Last time we spoke you were thinking about it. I guess because it’s so vast. “Exactly, and it’s kind of affordable, you know, if you stay in motels every night it’s about $50. I didn’t have enough money to enjoy Iceland properly. What else have I been doing? Just working and riding I suppose. “Yeah, well, everyone survived and had a good time. It was a lot tougher than we all thought it would be. 200 miles every day becomes quite a lot when you’re doing all back roads on small bikes. Camping every day grinds you down. There’s all this emphasis on doing these big overseas trips, but if you take back roads from the bottom to the top of the UK then it’s just as draining as riding anywhere else and just as eye opening because you’re looking at things from a different perspective. That sounds cheap for an eight day holiday, if you look at it that way. “Yeah, I didn’t really want to put a price on it, but I’ve got to make a living. I didn’t like the idea of making money out of it but I had to. And they said it was too cheap! I’m doing another one in May and that will cost £245, but that will include a bit more, like food and stuff. There are only five places left. Tony Hoare (another ex-MCNer) is coming on it as well just for the laugh. You’ve been pretty busy by the sounds of it then, and I guess this all started with your ride back from Sydney? “Yeah, I guess so. I got commission to write the book which kind of forced me into it and then I was on this path and I wanted to see it through. I wrote one book, so then I wanted to write another. Then I started doing a bit of work for magazines and I wanted to do a bit more of that, and now I’m doing my own magazine. Doing a tour wasn’t really a conscious decision, I just wanted to do Lands’ End to John O’Groats and I knew I’d keep talking myself out of it, so I put a time and a date online and now there’s more tours. "I guess as a freelance writer you’ve always got to be looking for the next thing. Doing my own magazine and doing the tours gives me a bit more of a predictable income. I’m doing the adventure stage at the MCN Show in February again next year as well. The shorter one is definitely more interesting to me. Have you heard of Al Humphreys? He does micro adventures when he travels on business - just walks to some woods outside the city for the night and sleeps under the stars. That appeals to me – as cool as riding round the world would be it’s just not feasible for most people. The thought is probably better than the reality. Do you think your desire for shorter adventures has come because you’ve done such long trips? “Yeah, I guess so. At the time I didn’t have anything to lose by doing them but now I’ve got a house, I’m married and I’ve got no desire to ne going off for any long period of time. A week feels long for me, so I guess it just depends on your situation. I’ve done it so I don’t need to do it again and I can just enjoy my days out on the bike now. I wouldn’t want to do Sydney to London again or anything like that. Nine months on a bike is far too long – you’ve got to be really up for it to do it. "You get a lot of people that say they want to do it but when push comes to shove they don’t because it’s just more commitment than they probably thought. I don’t know where I was going with that… but I wouldn’t want to do it again basically. I think part of the problem is there are people who’ve done big trips and they sell it as the most amazing dream ever and say everyone should do it. Some people say anyone can ride around the world, they say it’s safe easy and cheap but it’s the opposite of all three really. What are some of your overriding memories from the Sydney trip? “I don’t know. It’s a funny one because it’s got me to where I am now but I hate talking about it because it feels so long away. I guess just achieving it really. I set off with no knowledge, no money and only a basic plan. I didn’t have any mechanical know how so just getting it done. What do you enjoy about the outback? Would you do it on a postie bike? Do you recommend smaller bikes for adventures? “No, just take what you’re comfortable on. The GS was great for America and Iceland. People say folk only buy them because they’re sheep and they’re told to, but they’re just great bikes – you can do everything on them. If you’re comfortable on one, why wouldn’t you take it? Equally if you’re not comfortable on one then don’t. I’ve been riding the Suzuki V-Strom 250 and Kawasaki 300 Versys-X recently and they’ve got plenty of power to get through Europe on, it’s just changing your trip to suit your bike, I guess. Yeah, and some people seem really adamant that you should do it on whatever their preference is. Will you be doing the next Garbage Run on your postie bike? I guess as the organiser you need to be on something that can keep pace with everyone as well. How are you finding life as a magazine editor, publisher and designer? Thanks for talking to us, Nathan. I’ll see you at Motorcycle Live!